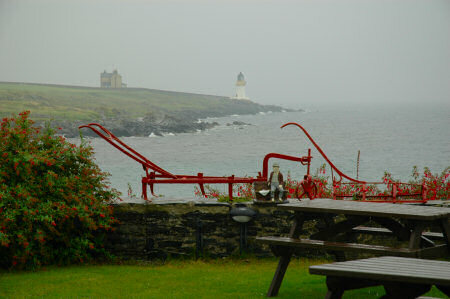 This picture was taken on a rainy rest day during a visit to Islay in August 2005. The travelogue entry has a few suggestion what to do on a rainy day, more suggestions for a rainy day from a similar day in 2004. This is a blog about the Isle of Islay, an island in the Inner Hebrides off the west coast of Scotland. It is run by Armin Grewe, a regular visitor to the Island. I don't live on Islay (yet? ), but that doesn't stop me blogging about Islay. I will blog about anything Islay related I can think of: pictures, news, links, whisky, bird watching, wildlife, you name it. Go to the IslayBlog Homepage to read more. Do you have something you would like me to blog about? Or a comment to this entry? Send it to me through my contact form. I'll try to reply as soon as possible and if possible I'll blog about it. Check the FAQ for some answers to questions and use the search to find pages. To be informed about new entries you can subscribe to the RSS feed for IslayBlog.com. Learn more about RSS at the BBC's 'What is RSS?' page.